After a long, wonderful holiday season full of rich (and fattening!) food, many of us are craving healthier fare. And with the colder weather typical of January, simple but hearty recipes sound mighty appealing. There’s nothing quite as hearty (or simple) as recipes based on dried beans, legumes, and pulses. These little nutritional powerhouses are great sources of protein, complex carbs, and fiber. Because they’re one of our oldest foods (dating back over 7000 years, according to some estimates), they feature in many of the world’s cuisines, offering us a wide variety of recipes and traditions to draw from. Italy’s rich culinary heritage includes numerous dishes that incorporate dried legumes and pulses. Some of my favorites are soups. Typically, these are meal-in-a-bowl recipes that are easy to make and that deliver comforting, satisfying flavor. Today’s recipe may be the best of the breed. This soup gets its flavor from pinto beans, lentils, and split peas. For the pasta, you can use any small shape, such as Ditalini. Or if you prefer, you could substitute a grain like cooked rice, quinoa, or barley. The recipe as presented is totally vegan. However, if you add Parmesan cheese for a garnish, it can be vegetarian. If you replace the water with stock, it becomes carnivorous. It’s an extremely versatile recipe. This dish is adapted from Judith Barrett’s Fagioli: The Bean Cuisine of Italy. This is perhaps the best cookbook on Italian bean cooking that I’ve seen (it discusses all sorts of dried legume and pulse dishes, not just soups). This recipe yields 6 to 8 hearty servings. Leftovers freeze well. Preparation time is about ½ hour. Cooking time is about 2 hours. Pick over pinto beans (to remove any dirt or stones) and soak 8 hours or overnight in enough water to cover by several inches. (See Notes for quick-soak method.) I usually leave the beans out on the kitchen counter overnight, but you can refrigerate them if you’re worried that they may start to ferment. 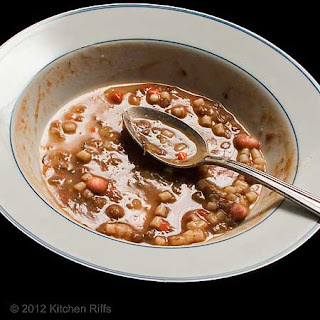 About 2½ hours before you want to serve the soup, drain the pinto beans, rinse, and set aside. Pick through the lentils and split peas, rinse, and set aside. Dice onion, carrots, and celery into pieces of about ¼-inch (or a bit larger), and dice the garlic into mince. In a soup kettle or Dutch oven of at least 5-quart capacity, heat olive oil over medium heat until it begins to shimmer. Add the diced onion, carrot, celery, and garlic. Salt and pepper to taste, and sauté the vegetables until the onion is translucent but not brown (about 5 minutes). Add the optional red pepper if using; sauté for 30 seconds so its flavor infuses the oil. Add the pinto beans, lentils, and splits peas. Cover with 12 cups of water. Add thyme or rosemary, bring soup to a simmer, and simmer for an hour and three-quarters. Taste soup and adjust seasoning. The beans should be soft and tender; if not, cook a bit more. Add more water if necessary. Add pasta and stir so it doesn’t clump on the bottom of the pot. Cook until the pasta is done to your taste (usually 10 or so minutes). Taste and adjust seasoning. Then serve, topped with optional garnish (a drizzle of extra-virgin olive oil or a sprinkling of grated Parmesan or Romano cheese). Then about 45 minutes before serving, sauté the onions, carrots, celery, and garlic; add them to the beans and cook for about half an hour to incorporate their flavor. Then 10 minutes or so before serving, add the pasta and cook it. The advantage of this method is that it allows the vegetables to retain more taste and texture. And simmering the veggies with the beans for half an hour is just enough time for the two to combine their flavors. To cook the beans for this alternate procedure, place soaked/drained beans in a pot and cover with water. I usually add a peeled onion that is cut in half, and several peeled and whole garlic cloves. I also add thyme or rosemary, and cook for an hour or so until the beans are almost (but not quite) tender. At that point, I sauté the vegetables (steps 6 & 7 above) in a frying pan, add them to the soup, and then proceed with step 10 above. I usually fish out the onion halves before adding the sautéed vegetables. Quick-soak method for beans: Pick through the beans, then rinse them. Place beans in a large pot and cover with several inches of water. Bring to boil, and allow to boil for 2 minutes. Remove from heat, cover, and allow to sit for at least one hour. Then drain, rinse, and proceed with recipe. Beans soaked overnight have slightly better texture (when cooked) than beans that are quick-soaked, but the difference is minimal. In fact, nowadays when I use dried beans, I almost always use the quick-soak method. Why soak dried beans? Because they cook much quicker when you rehydrate them. Most beans benefit from soaking. 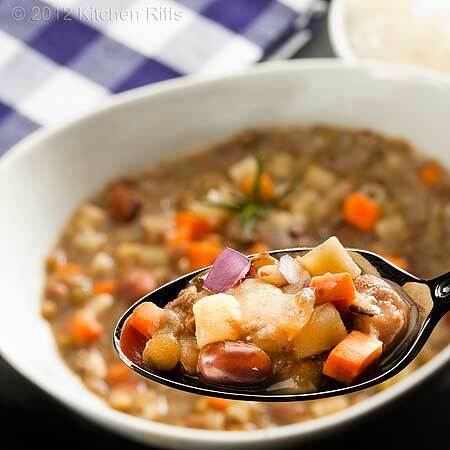 However, because lentils and split peas cook fairly quickly without rehydration, you can cook them without soaking. A secondary benefit is that while rehydrating, the beans also release most of their flatulence-inducing sugars (oligosaccharides) into the water. When you discard the soaking water, you discard a few nutrients that have leeched into it. But you also discard the substance that causes some people to shy away from dried beans. If you prefer a soup that is non-vegan and non-vegetarian, you could sauté about 3 or 4 ounces of diced pancetta (cured pork belly that is like bacon, but not smoked) or prosciutto with the vegetables in step 6. The original recipe calls for this, but I don’t find that it adds a tremendous amount to the flavor of the soup. If you really want to add meat flavor, don’t bother using pancetta or prosciutto. Instead, substitute stock for water. A ham stock is particularly tasty in this soup. If you don’t have homemade stock, you can use commercial stock base (meat stock that has been reduced to a paste). It’s more flavorful and much better quality than most canned stocks — and much better than bouillon cubes. For more details, see Stock Excuses. My favorite brand is “Better than Bouillon,” which many supermarkets carry (you can also order it from Amazon). I’ve heard great things about Minor’s Brand, though I haven’t used it. They sell primarily to restaurants and other commercial entities, but individuals can order through their website. The amount of onion, carrot, celery, and garlic in this recipe can be adjusted to suit your own taste. You can substitute cranberry or borlotti beans for the pinto beans, if you wish. If you prefer to add rice or another grain to this soup (rather than pasta), I suggest you cook it separately so it doesn’t absorb too much of the soup’s liquid. Diced tomato goes well in this recipe. Add a 28-ounce can to the soup when you make it (more if you like, although that’s enough). Or when you reheat leftovers, add a 16-ounce (or larger) can. This isn’t a fancy dish (is any bean soup fancy?) but it’s extraordinarily flavorful. Everyone I have served it to likes it — a lot. I wouldn’t hesitate to serve this soup to guests as the main course in an informal meal. Just add a salad, some good bread and butter (or olive oil, for dipping), and a bottle of wine. You’ll have a pretty good dinner. And your guests will admire your exquisite good taste — a lot. Hearty, delicious and satisfying. This soup looks so healthy and colorful. Love it!!! Hi Asmita, it really tastes great. And for a soup, it does have nice color! Thanks for commenting. I'm definitely craving healthy food right now. This looks fantastic! Hi Beth, thanks! I love holiday food, but come January simple (but tasty!) rules. Thanks for stopping by. Yummy healthy soup for the winter season! Hi Natalie, it is indeed yummy! One of my favorites - I'll bet I make it a dozen times a year. Thanks for the comment. I make something similar and it is always delicious and sooo filling. Perfect for a cold winter day. And it tastes even better the next day. Hi Abbe, glad you have a similar recipe that you enjoy. 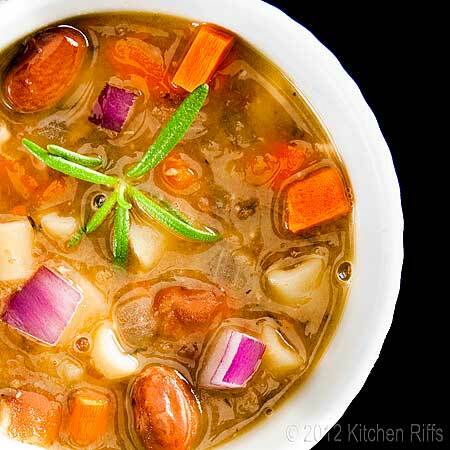 I love any kind of bean soup, and you're right that most are better the next day. Thanks taking time to comment. This soup looks delicious. Such helpful information on cooking with beans. Thank you for sharing. This soup looks wonderful. Hi Vicki, thanks for your kind words! It really is a wonderful soup. Thanks for stopping by. I feel like you wrote this post for me. That's exactly what I need to do. Eat healthier foods to detox from the holidays. The great thing about this is that I wouldn't feel like I'm missing out on anything. Looks delicious! Hi zenchef, yeah, detox is the order of the day - way too much good food the last couple of months. 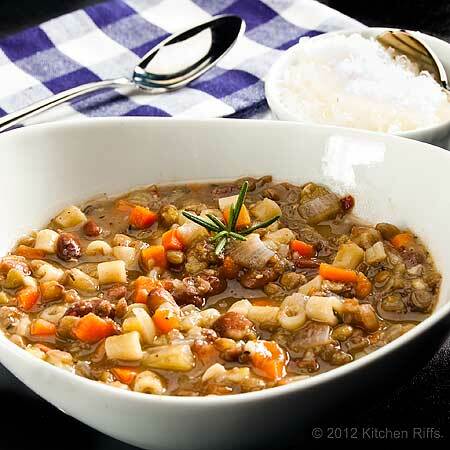 This soup is really great for eating healthier - the flavor is really good, legumes are pretty satisfying (and filling). Thanks for the comment. I really like the idea of adding some pancetta or prosciutto! But I also think this soup would be great without it. It looks hearty and the perfect thing for a cold North-Eastern winter day! Saving your recipe! Hi Simply Tia, the pancetta or prosciutto do add a nice touch. But it's a super soup with or without. Thanks for commenting.